Pretty much every online bingo site nowadays will offer you a welcome bonus to entice you into joining and playing with them. The welcome bonus can usually only be used to play bingo with, and can be in the form of a free no-deposit bonus, or a deposit bonus. The free no-deposit bonus is a great way to try out a site without having to deposit any money. Plus, you can win real money with it to, although some sites do have a wagering requirement - more on that later. Some sites also will offer you a re-deposit bonus which is applied to every subsequent deposit you make, and is offered as an incentive to remain a customer of theirs. The re-deposit bonus (sometimes called reload bonus) is typically a lot smaller than the initial welcome bonus, but is still a great feature and makes your money last a lot longer! So, you'd think that the bigger the bonus the bingo site offers you the better right? Well not exactly - which brings me back to the wagering requirement some sites impose. The wagering requirement is a condition of the use of the bonus - usually it states that in order to withdraw any money won off the bonus, then you must have purchased a certain number of bingo cards. The number varies from site to site but can be anywhere from 2 times the bonus amount, to 10 times the bonus amount. So, if you've received a £20 bonus, then you might have to purchase up to £20 x 10 = £200 worth of bingo tickets before you can withdraw any money won off the bonus. This is an extreme scenario, but always check the terms and conditions of the bonus to ensure there are no nasty surprises. First time depositors only. Min deposit: £10. Max offer: Bingo Tickets worth £80 (£30 on Street Party & £50 on Big Bang) plus 10 Free Spins on Fluffy Favourites with winnings capped at £1. All winnings will be credited to your real money balance. Promo code: LOVE90. Full T&C’s apply. Valid until further notice. T&Cs apply. First time depositors only. Min deposit £10. Max offer per deposit: Bingo tickets worth £30 (on Street Party) + £40 (on Big Bang) plus 10 Free Spins (on Fluffy Favourites with winnings capped at £1). All winnings credited to your real money bankroll. Valid until further notice. Promo code: KOZMO. T&Cs apply. Winnings Paid in Cash, No Max Win! Candy Club Loyalty Points with No Wagering! £7million paid out every week! Win £5k in Roller Coaster Bingo! First time depositors only. Min deposit £10. Max offer per deposit: Bingo tickets worth £30 (on Street Party) + £40 (on Big Bang) plus 25 Free Spins on Fluffy Favourites. Free Spin winnings will be capped at £2.50 and credited to your real money balance. Free spins expire after 7 days. Promo code: GET25. T&Cs apply. Deposit £10 Get £70 Bingo tickets + 10 Free Spins - No Wagering! First time depositors only. Min deposit: £10. Max offer: Bingo Tickets worth £70 (£30 on Street Party and £40 on Big Bang) plus 10 Free Spins (on Fluffy Favourites with winnings capped at £1). Free Spins expire after 7 days. All winnings will be credited to your real money bankroll. Valid until further notice. T&Cs apply. Keep what you win - No wagering requirements! The above bingo sites will give you a bingo bonus where no wagering requirement applies - these are particularly popular because it means that whatever you win off the bonus is yours to keep and withdraw whenever you want! So you see, bigger is not always better - go ahead and try out the above bingo sites with no wagering requirement! If any of the above bingo sites aren't your cup of tea, or you've already taken advantage of their no-wagering bonus, then you might be interested in these bingo sites which offer bonuses with low wagering requirements. Free Status Increase Bonuses up to £20,000! Minimum £10 deposit required. One per customer. New customers first deposit only. 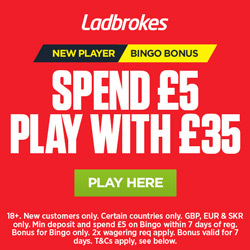 Max bingo bonus £150. Bonus can only be used when cash balance is £0. 1x wagering requirement to withdraw bonus. Bonus expires in 42 days. Free Spins credited within 48 hours and only available Starburst game. T&Cs apply. New customers only. Registration required. Min £10 deposit. £30 bonus includes £10 slots bonus which must be wagered x30 before withdrawal and £20 bingo bonus which must be wagered x3 before withdrawal.Free Spins must be used on Batman and Catwoman Cash Games and all winnings must be wagered 30x before bonus converts to cash. Bonus expires 7 days after receipt if not used entirely. T&Cs apply. Bingo bonuses with low wagering requirements are still very good value and worth trying out - you'll often find that you've already fulfilled the wagering requirements before you even know it! Take for instance a bonus with a 2x wagering requirement - You deposit £10 and get a £10 bonus. The bonus must be wagered 2 times over before you can withdraw any winnings. Normally you'd play a few games - win some and lose some, all off your initial £10 deposit. They all count towards your wagering requirements, and so usually you wager far more than your initial deposit. Spend £10 Get £30 Bonus + Choose Your Prize! New players only. Wager min £10 (excluding 'casino games') within 7 days of deposit, get 300% bingo bonus (max £200) + 1,000 Wink Rewards [WR] worth 100 Free Spins [FS], £20 Games Bonus, £20 Bingo Bonus, 100 Bingo Tickets or £10 shopping voucher. WR may be redeemed in Wink's Shop to other bonuses or vouchers. Bonus + WR must be claimed within 7 days. Suppliers & vouchers may vary. FS valid on specific games for 7 days, wins granted in bonus & capped at £20 (per voucher). 50X wagering on games bonus. Bonus wins are capped at £100, exc. jp wins. Wagering reqs vary by game. Bingo Tickets are to the £1,500 Tuesday’s Treat room. 2X wagering on bingo bonus. Withdrawal restrictions & full T&Cs apply. New players only. Deposit min £10 for 200% bingo bonus + 200% games bonus (total max bonus £100) + 15 Free Spins [FS]. One 1st Deposit Bonus per player. FS available for 7 days, FS wins granted in games bonus after all FS are used and capped at £4. 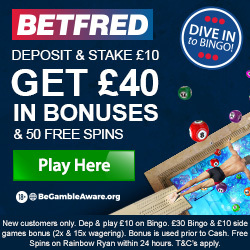 Bonus wins are capped at £100, exc. JP wins. 2x wagering on bonus + deposit. 50x wagering on games bonus; wagering requirements vary by game. Withdrawal restrictions and T&Cs apply. And here are their respective wagering requirements..